What is loosely described as the Caucasus is a large geographical region in the southern European part between the Black Sea and the Caspian Sea. The Great Caucasus Ridge with its high snowclad peaks, which extends more than nine hundred miles from east to west, divides the area into the North Caucasus and Transcaucasia. The latter comprises the following three countries: Armenia, Georgia, and Azerbaidzhan. The North Caucasus is part of the Russian Federationand includes the following Autonomous Republics: Daghestan, the Chechnya, Ingushetiya, Kabardino-Balkaria, and the North Ossetia. The Caucasus' advantageous geographical position on a route between countries of the West and the Near East, as well as its rich and varied natural resources, created favorable conditions for the emergence of ancient human civilizations in this area. As far back as the third millennium B.C., the Caucasus had regular contacts with Asia Minor, Syria, Mesopotamia, Persia, China, and India. It was in Transcaucasia that Urartu came into being, the most ancient of the then existing states. Urartu reached the zenith of its development in the eighth century B.C. 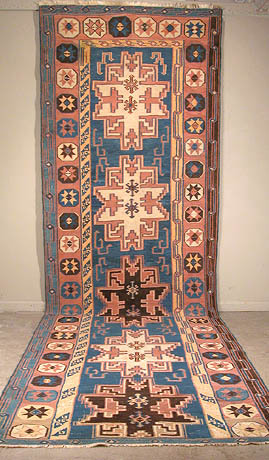 The numerous ethnic groups and peoples inhabiting the Caucasus have created a rich culture, in which folk decorative arts play a leading role. Such traditional handicrafts as carpet-making, cotton-, wool-, and silk-weaving, patterned knitting, embroidery, metalwork and goldsmithing, pottery, and wood and stone carving have age-old records in the Caucasus and are still practiced on a large scale today.